The new groups of bacteria (CPR) greatly expand the known and characterized phyla (top). 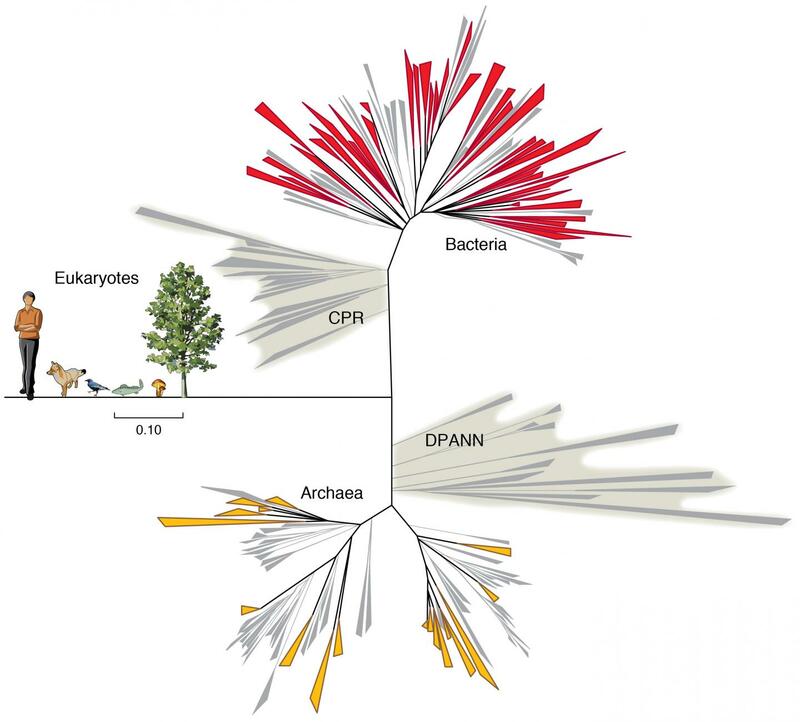 These and previously reported new groups of Archaea (DSPANN) show that the Tree of Life is oversimplified. Graduate student Christopher Brown, Banfield and their colleagues will report the discovery online June 15 in advance of publication in the journal Nature. Banfield is also a researcher in the Earth Sciences Division at Lawrence Berkeley National Laboratory. The UC Berkeley team realized that the only way to clarify such vague classifications was to sequence the genomes of these organisms, and they decided to collect samples from groundwater at a remediation site in Rifle, Colorado. Since they suspected that many of the unusual microbes were small, they analyzed samples that passed through 0.2 micron filters, which catch most bacteria and are often used to purify water. About half of all the genes in these 35-plus phyla are new and unlike other known genes. The recognizable genes suggest that most of the bacteria use a simple process of fermentation to make the energy they need, instead of using aerobic or anaerobic respiration like many other bacteria. They also have unusual ribosomes, the multi-protein machines that translate genetic instructions into proteins. In fact, routine genomic scans would not detect them because of their distinctive 16S ribosomal RNA genes. The UC Berkeley team found that some of the bacteria have very rare inserts, called introns, in genes coding for 16S ribosomal RNA, which make them invisible to current detection techniques. “We found that all of these have at least a couple of unusual ribosomal features, and many are missing ribosomal proteins that are thought to be either universal across the tree of life or in all of bacteria,” Banfield said.